The beer trade has been a good one for Constellation. Bottoms up! Constellation is cashing in on America's love affair with Corona. Shares of Constellation Brands (STZ) opened sharply higher Wednesday after the beer and wine company reported strong quarterly results, although the stock has now fallen back. The buzz kill came after Constellation executives said on a conference call with analysts that the cost of expanding a brewery in Mexico would be much higher than previously expected. The company raised its estimate for the cost of upgrading its Nava brewery to a range between $900 million and $1.1 billion, up from the previous estimate of between $500 million to $600 million. So far, Constellation has spent about $140 million on the brewery. Robert Ryder, Constellation's chief financial officer, tried to put a positive spin on the news. "Despite the increased cost to build out the brewery, our improved commercial results should keep our cash flow and delivering goals intact," he said. Constellation said net income surged 92% in the fourth quarter to $157 million, or 79 cents per share. Analysts were expecting the company to report earnings of 76 cents per share, according to FactSet. 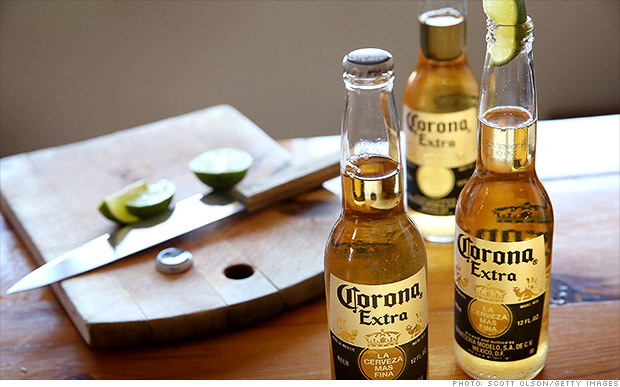 Corona is the best-selling imported beer in the United States, according to Constellation CEO Rob Sands. Sales rose to nearly $1.3 billion, thanks largely to about $600 million from Crown, the division that distributes Modelo brand beers, including Corona, in the United States. "We had a great year, driven by our beer business," Sands told analysts on a conference call today. Constellation paid $5.3 billion to take full control of Crown last year as part of a complex deal between Anheuser-Busch InBev (BUD) and Mexico's Grupo Modelo. The deal was held up in court after the U.S. government sued to block it over anti-competitive concerns. But regulators relented after AB InBev and Modelo gave Constellation "perpetual rights" to distribute the popular Corona beer in the U.S. market and tossed in a major Modelo brewery. So far, Constellation's bet on Mexican beer is paying off. Net sales in the beer segment rose 13% in the fourth quarter " due to volume growth driven by strong consumer demand," the company's report states. The strength in beer helped offset softness in sales of wine and spirits, which grew only 1% in the quarter. Constellation expects beer sales to continue growing in its current fiscal year and is looking for income to grow "in the low to mid 20 percent range." That should lead to better-than-expected earnings. Constellation is now targeting earnings of between $3.75 to $3.95 per share for the full year, which would translate to earnings growth of up to 27%. Now who needs a lime? Where's the drama on Wall Street? #StupidStock Move of the Day! Yes, Urban Outfitters may be finally turnings things around. But $URBN up 17%? Seems a bit excessive, no?